Say good bye to bunch of messy TV peripherals and replace it with your cool looking PS3. 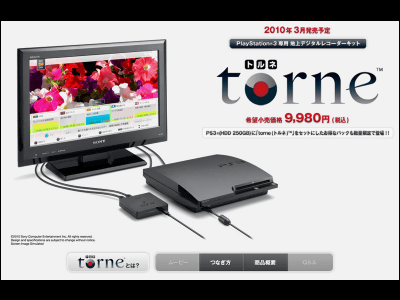 "torne" will make your PS3 into TV tuner and recorder. "torne" kit comes with tuner box and related softwares. The kit can be easily connected to your PS3 via USB. The product will be sold at 9,980 Yen(about $108 USD) from this March. By using 2.5" HDD, you can easily change your PS3 to ideal Blu-ray HDD recorder. The kit can also record onto outer USB HDD so there's no difficult operation needed. The kit can also record while you are playing games(except while playing PS2 games), upscaling DVD videos, playing MP3 files. No more messy TV stands with dusts and spaghetti-ized power cables. This simple kit will replace them.